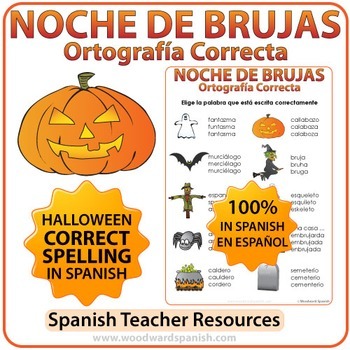 Spelling Activity with Vocabulary associated with Halloween in Spanish. There are 10 images of things associated with Halloween. Next to each image are three words written next to it. Students must choose which of those 3 words are spelled/spelt correctly. The other two words look or sound similar to the correct one. The 10 words in this activity are: fantasma, calabaza, murciélago, bruja, espantapájaros, esqueleto, araña, embrujada, caldero and cementerio. This worksheet and its instructions are completely in Spanish (without any English). This quick activity is ideal as a filler before the bell rings or for those students that are fast finishers. 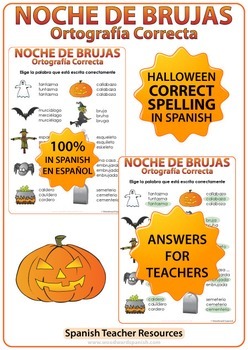 This resource is a part of the Spanish Halloween Worksheets and Activities BUNDLE which includes 6 different activities.